Another quality post – thanks Phil. Wd love to know UK, Australian and NZ ” private” review sites for an equivalent list for these countries. Thanks for stopping by, Angela. Re. UK, Australian, and NZ sites, that’s a tough one. I think it probably comes down to yell.com and touchlocal.com for the UK, and yellowpages.com.au and touchlocal.com.au for Australia and NZ. Maybe there are also a couple of industry-specific sites – but I’m not sure what they are off the top of my head. Good call. Not sure how prominent the reviews are, but it does appear that Cylex allows anonymous reviews. Nice post Phil and thanks for sharing. Sure thing, Chris – thanks. What about, like Cylex (already mentioned), Yellowbook, Kudzu, Hotfrog, Merchantcircle, and the like. They require a basic “account” (generic profile with email confirmation), to write reviews for businesses. They seem to be geared more toward local businesses. Although I wouldn’t say they’re prominent sites, they do tend to show up for local business searches (for me). And they encourage reviews. Kudzu is a good one. It’s on there. The others just aren’t very prominent. But if you have a surplus of happy-to-review customers, sure, encourage reviews on the smaller sites. Oh, not a surplus- just the opposite. It’s difficult to get my customers to write reviews, no matter how happy they are with their experience. My thinking initially was, the more sites available for reviews, the better chances of getting them. But it hasn’t worked out that way. Thanks for the reply, great article, as always. Thanks good to know the anonymous sites just in case a customer decides to post a bad review, but i suppose if you run your business right you won’t get any bad reviews. That’s only one reason to know about “anonymous” review sites. But even good businesses get the occasional dud review. This was great info… paralysis by analysis is a B…. 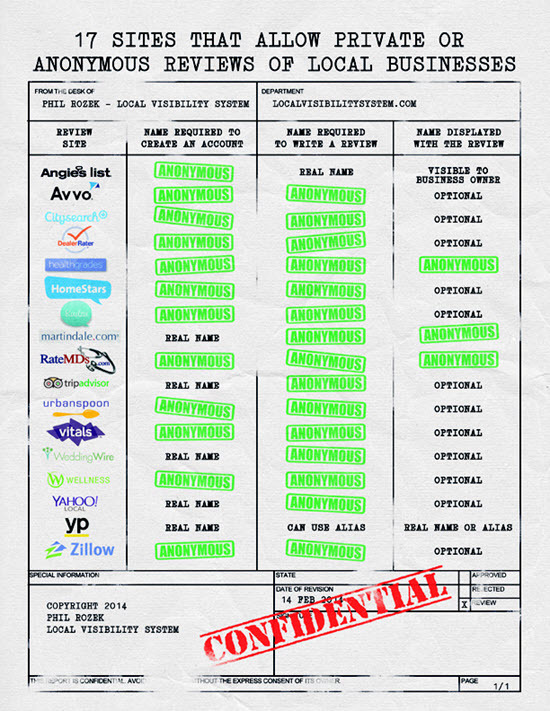 We have been advertising 5 options for a long time and over 95% of the reviews were from angieslist and yelp. We dropped down to 3 options making the 3rd (google) the 1st option with diagram, and now we have had reviews being placed on 2 review sites from the same clients for the first time. Thanks for the great case-study, Jason. Your post is new but possibly dated already (oh marketing, the constantly changing landscape). Citysearch requires an account which than shows up and it viewable by anyone looking to see what other reviews you’ve written. So a customers name will appear next to their review. It appears you’re right about a name being required now, but the full name shouldn’t show up next to the review. Thanks, Andre. Hey Phil, I heard recently that a German legal case against Google has forced G to now allow anonymous reviews. Have you heard anything about that? 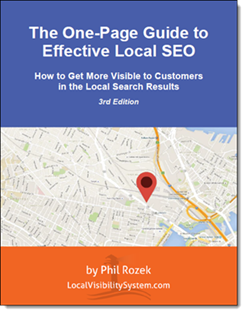 Also, this post http://searchengineland.com/how-to-leave-anonymous-business-reviews-in-google-174532 over on SearchEngineLand is dated but I wondered if it’s still a valid strategy. Know anything about that? Hey Phil – thanks! Always so hard to keep up on these things, just not enough time in the day to be productive and keep up on ‘news’! Thanks again. I was considering to allow my local directory site to allow anonymous reviews or not, your post have me made up my mind to allow it, as I see why people should be able to post private business review. Don’t mean to cause paralysis by analysis, just maybe having another option would be a good thing like providing consistency or more information for potential local business customers. Though opening anon reviews would invite spam or shady intentions, I’ll see how it goes.